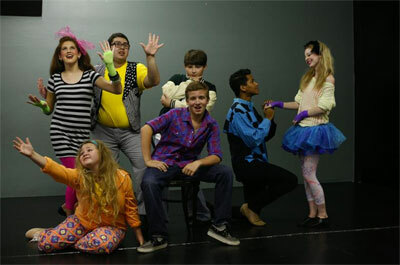 The cast of "Fame: The Musical," produced by the Bakersfield Music Theater School of the Performing Arts. The students performing in this weekend's production of "Fame: The Musical" aren't just playing the characters -- they're really playing themselves. Produced by the Bakersfield Music Theater School of the Performing Arts, "Fame: The Musical" is a stage adaptation of the 1980 hit movie and the equally successful television show about students at New York City's famed High School of Performing Arts. The musical follows a cadre of teenage hopefuls and some of their teachers through their struggles to become actors, dancers and musicians, or even just famous. Director Jennifer Resolme said the coincidence of her student performers portraying characters just like themselves was not lost on the company. "They had a lot of fun with the character types -- the way they're written into the script, and finding the parallels in their own group," Resolme said. The musical opens with a production number in which the students are anxious about being accepted to the prestigious school, a feeling many of her students are experiencing right now. "A lot of them are juniors and seniors in high school and they're hoping to be accepted to the colleges and schools they're auditioning for," Resolme said. "We had two students audition in Los Angeles this summer." Resolme said this is the first time the school has done this kind of musical, a departure from the more traditional musicals that also requires the performers to be multi-faceted -- dancing, singing and acting. "I thought about that when we picked the show," Resolme said. "But we found the kids and it really fell into place. "We had toyed around with the idea of casting the teacher roles with adults, but because we had so many talented kids, we cast them -- we're graying their hair and dressing them in adult clothes." A couple of songs have been cut and the "cuss words" removed, but otherwise this production is identical to the off- and on-Broadway show. The audience meets the characters as freshmen hoping to be accepted into the school, and follows them as they compete for parts, fall in love, struggle with such issues as drug abuse, family problems and learning disabilities, and try to reconcile the demands of high school with the quest for fame. Moments of youthful exuberance are countered with high comedy, serious drama and even tragedy. The show is choreographed by Frank Sierra; Jill Burdick is the vocal director.